This is 1" whole round 4' high and 8' long Tonkin bamboo fence in natural color already coated with a clear low gloss varnish to help preserve bamboo against discoloring. We use strong galvanized steel wire through the center of poles to secure poles tightly together. Also ours has been fumigated twice to insure no insects. Bamboo fencing makes a great way to give privacy to your yard or hide a chain link fence that you don't want to do away with. The bamboo fencing is attached to the support structure with staples or bailing wire. The staples catch the wire and are not seen because they disappear between the poles of bamboo. You could also use screws to attach poles if you feel you need better support. 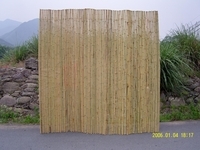 Shop for eco friendly rolled bamboo fencing at wholesale prices online today.